Christmas time, it’s foggy and misty outside and I feel that it is my duty as a writer to be inspired by the season and write something meaningful while I sip from a cup of hot chocolate in front of me. However what I want to say is nothing new or christmasy. I just want to take a couple of minutes to share how grateful I am for this precious journey of life, everyday is truly a gift and an opportunity to create a positive impact. In spite of all the things that are backwards in this world, in spite of this huge need for human beings to kill everything and everyone around them just to feel “superior”, I find the space to be thankful because I know that each day the chance for change is reborn. I am thankful for the people that choose peace over violence everyday, for the people that look inside themselves to find true happiness instead of hoping to reach it someday, for the people that have opened their eyes and don’t settle for the current model of society a few are selling, I am thankful for all of those who listen to their hearts, spread their wings and fly. The end of the year brings the countdown and remembrance of accomplishments and the new goals for the year to come, would it be possible to include one action to benefit all other living beings in this long list full of self-satisfying delusions? Wouldn’t it be great to count down how many lives we served and how we helped to eradicate violence, hate, hunger, war, corruption, abuse, environmental devastation? This human life is so precious that we have the opportunity to create our own reality and help those who are not in the circumstances to do so. What if instead of supporting the destroyers of Earth buying all of this things and ideas that we don’t need we used that energy and that money in a practical way to actually change the world? Walk more, drive less, meditate and treat others with kindness, acknowledge how important and kind others are, treat the world with respect and realize it’s possible to share. Stop identifying yourself with one religion and one country, understand that we are all human, we are all important and we all want the same thing: love. All living beings deserve the same freedom and respect as you think you deserve, it’s time to stop the violence towards our planet… we have the power to change the world what number of year are we waiting for to begin? Supporting a community is a concrete way to change the world, one action at a time. Community means together, individuals with shared goals that join their actions and define their way of living. This premise is very basic however when taken into practice it actually generates positive impact at many levels. The first community we are brought into as we are born is our family, the family defines the way of living and traditionally this means teaching youngsters what the adults have learned, which is a lot of self-grasping, in other words to see one self as the center of the universe, to care about the self first, and then care about their family and at last maybe to care about some of their acquaintances. Human beings have adopted this idea that what’s important is to take into consideration only the satisfaction of their own individual needs without leaving space to reflect upon the damage or benefit each action they make in daily life brings to the environment, other people and the rest of the living beings in the planet. This is the way humans are educated into society, with a high sense of individuality, competition and needs that must be fulfilled but little or no regard for the benefit of others. So why is a community different? A community starts with a decision, a conscious process to gather up with individuals that want to get certain results in their lives and that are aware that nothing is really meaningful if it’s built alone and for no one else’s benefit. 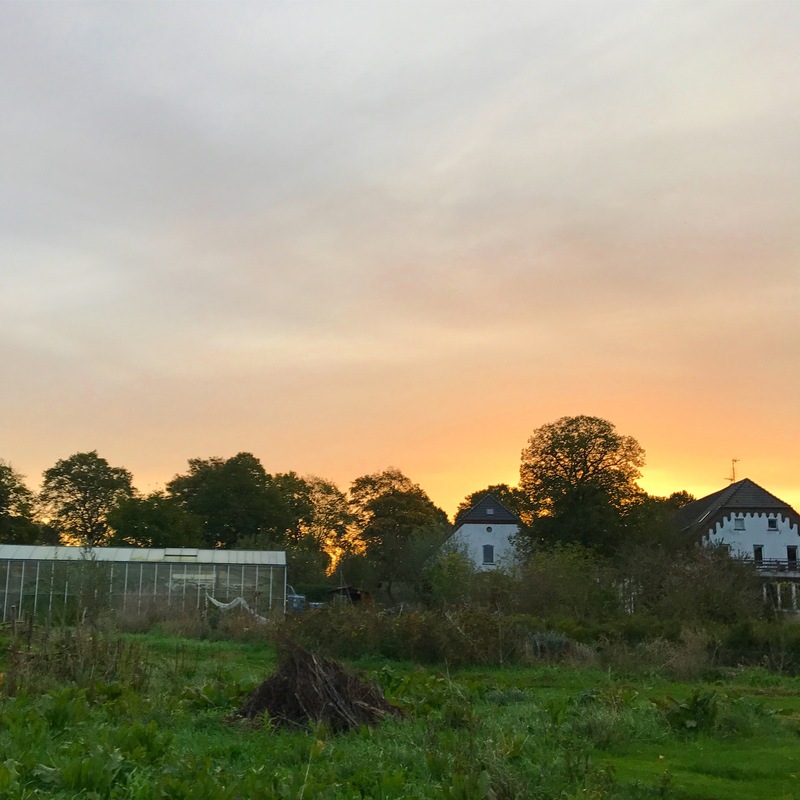 For the past month I had the opportunity to spend time with a community of people in North Germany where sustainability and environmental conscience constitute one of the pilars of this way of living. 1. The environmental aspect- one person can generate an enormous impact on the environment, from the energy consumption to the waste generation, living in a community sharing spaces, using alternative energy sources and processing waste reduces the impact of not one but many persons at the same time, while it also creates an education around the environment and a conscience in each person. 2. The social aspect- one of the most immediate and tangible benefits the community gives is that people have the opportunity to actually share, they share their time, their feelings, their goals, their ideas, their self with other people in a welcoming space, the intercultural exchange and intergenerational exchange is enriching for every member of the community whether they are there for a shorter or longer period of time. 3. The personal aspect- The constant interaction with others is a way to know yourself better, the community provides many constant opportunities to know and recognize the self in another may it be by a good friendship or a more complicated interaction, each person is a mirror for another and the self is presented with many chances to learn new things: acceptance, love, lack of judgement, respect, kindness. Environmentally responsible communities are growing around the world and are actually changing the model of society with a different mindset, they are rescuing spaces, restoring fertility to the ground, growing their own food in a real healthy way (not the commercial unhealthy idea of healthy), providing for their own in a space where people have the freedom to be themselves and where the personal dimension of the self inside and outside has an equal role as the mental, physical and spiritual dimensions. Isn’t this our idea of a desirable society? Bringing in one’s skills and talents into a place where they will be valued and appreciated is a good way to start creating a caring and responsible world. New people are always welcome to join and experience it whether on a short or long term basis. For some people the idea of changing the traditional model of life is too radical, but communities also allow part-time involvement, so it doesn’t mean that everyone should quit their daily jobs, rather it is a chance to give something to the world, something that was missing and only you can provide. For more on volunteering at an eco community in Germany contact by message.